The stimulating Clay Center for the Arts & Sciences is a multi-million dollar facility with performance and gallery spaces. The Maier Performance Hall is home to the West Virginia Symphony and hosts a range of world-class concerts and shows each year, while the smaller more intimate Walker Theater is the perfect venue for plays and small concerts. 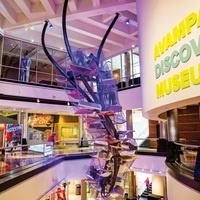 The Avampato Discovery Museum includes several galleries geared toward kids, as well as stellar art galleries with permanent and rotating collections. The Digital Dome offers planetarium shows using state-of-the-art technology. New at the Clay Center! In Nov. 2017, the Clay Center opened AN ENTIRE FLOOR of brand new exhibits featuring water, health and music! Splash through a replica of the Kanawha River as you test your handmade boat by sending it through locks and dams! Get your body in motion in Healthy Me with a human size hamster wheel, basketball hoops, fast pitch softball, and more challenges to test your physical skills! The Maier Foundation Music Studio puts your creativity in action as you make your own music, conduct the West Virginia Symphony Orchestra and explore a futuristic music machine! Home School Day - April!